Plain Lemon satin tie measuring 8cm in width. 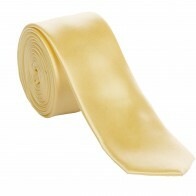 This yellow/gold tie is perfect for formal occasions such as weddings where colour matching is imperative. 8cm in width at the widest point.